That screenshot of an email, above, is the note I received back from "The Master Gardener" at the University of Illinois Extension office in DuPage County. And...now, I think we can put this mystery to bed: we have Ostrich Ferns. Confirmed. Yesterday, I posted a few photos of them at my mother-in-law's house and those are the photos that I supplied to the Master Gardener. 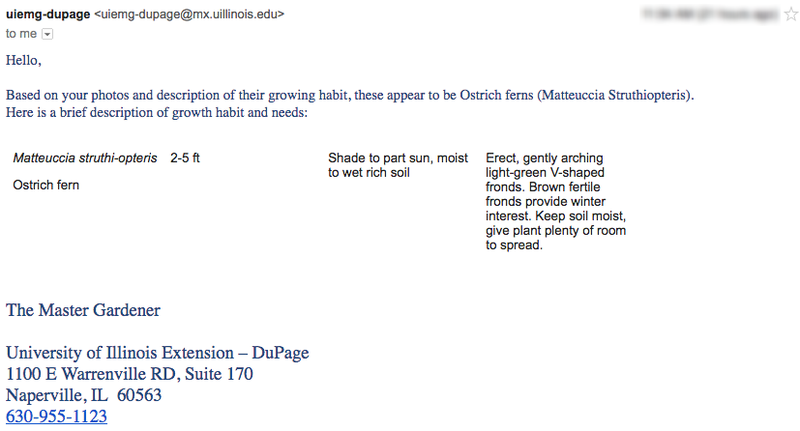 No more guessing about Cinnamon vs. Ostrich ferns for all the ferns that I have in Naperville. But, what about the one I bought at the plant sale this year? It was marked as a Cinnamon Fern, but could the gardener who brought it in be confused like I was? Time will tell. But, that one is planted in Elmhurst at our temporary home, so it won't be transplanted anywhere else to get confused going forward. I feel good about this. And, I feel really great about the Master Gardener. What a resource! I'm going to use it whenever I have a gardening question going forward. And you should to! You can reach them at the email address on this site.